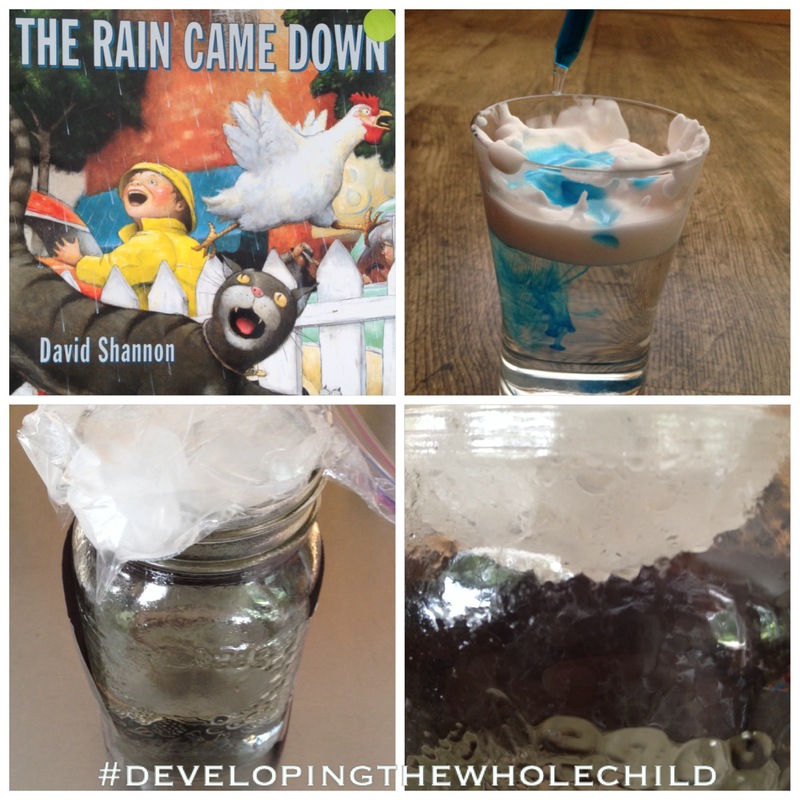 The Rain Came Down by David Shannon – The rain came down is a wonderfully illustrated story about the quarrels of a small community during a rainstorm and how they lend each other a hand once the sun comes out. 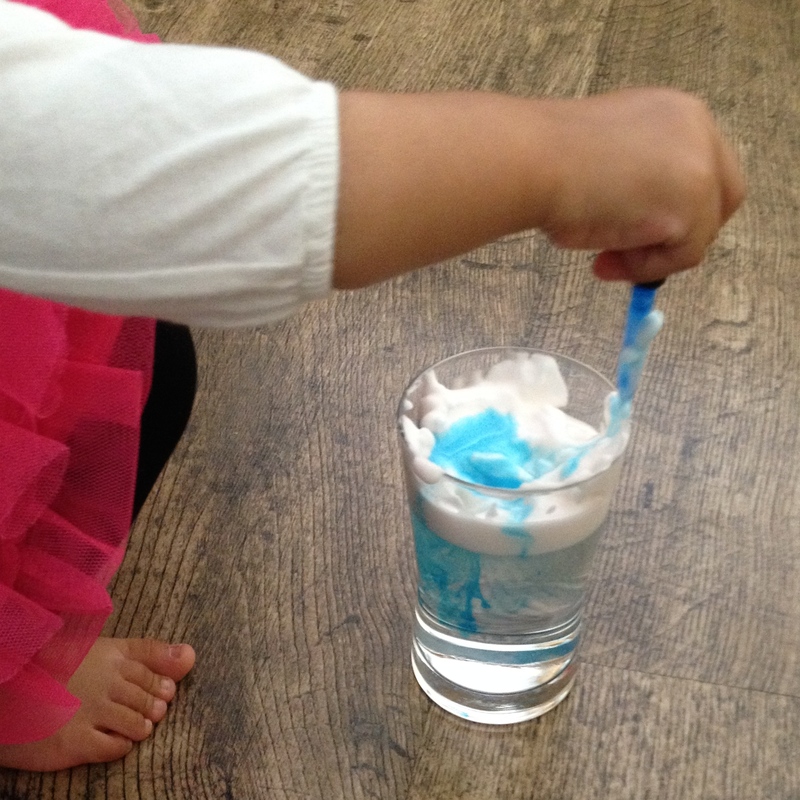 I topped a glass of water with shaving foam to represent clouds. R then dropped water, coloured with blue food colouring, into the glass to make it look like rain. She enjoyed adding water droplets and then swirling the mixture around using the dropper. a. Scientific Testing. Set up four cups of water: two with hot water, two with cold. To one cup of hot water and one cup of cold water, have the child drop in hot water coloured with blue food colouring. To the other cup of hot water and the other cup of cold water, have the child drop in cold water coloured with food colouring. Ask the child to observe and record the differences in how the different experiments behave. With older children, have them come up with their own hypothesis to test. I did this as a demonstration for R and she couldn’t stop saying “wow!! 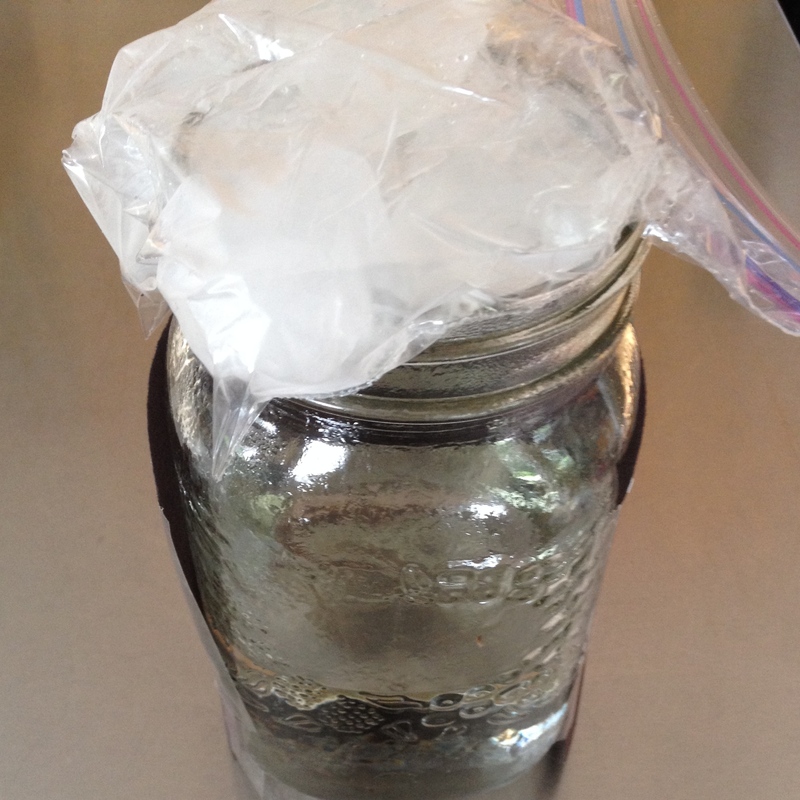 !” I put boiling water into a mason jar, dropped in a lit match (to add particles in the air) and covered the mouth of the jar with a a bag of ice. Although the pictures don’t show it well, clouds form inside the jar and eventually, enough condensation occurs and it “rains” in the jar. I’ve shown this experiment to my grade two students during our study of solids, liquids and gases and they were equally as enthralled by it as R was! a. Discuss the water cycle with the child and watch The National Science Foundation‘s video to learn more. b. Put on your rain boots and raincoat and head outside in the rain to splash in the puddles together. Remember to also click the banner below to vote at Top Mommy Blogs for my blog today! I appreciate it so very much! Wow you go mom! I am starting themes soon and they’re nothing like this lol ! Thanks, Jill! I bet your themes will be great. I’m continuously working on improving our lessons and get plenty of ideas from other moms!